Day four of our road trip was the first in which we had no travel planned; we had devoted the entire day to exploring Cuyahoga Valley National Park in Ohio. It’s location, between Cleveland and Akron, may come as a bit of a surprise – it did for me. But, it clearly offers a nice escape from its more urban surroundings. 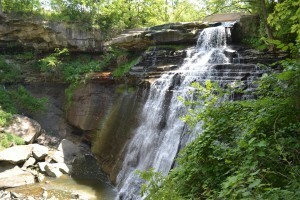 Cuyahoga Valley is the seventh national park my husband and I have explored together, and the first of this road trip. We were excited to get out and seize the day! After some tough sleeping conditions the previous night, we decided to skip the rain tarp on our tent in exchange for a cool breeze. It was the right choice – we slept much better and didn’t wake until 8am. I enjoyed waking up to a sunny morning, surrounded by nature. For breakfast we headed to the fire pit to boil some water for our tea and oatmeal – a fine start to the day. After cleaning up, it was off to the visitor’s center to get a stamp in my National Parks passport (yes, I have one of those) and get the lay of the land. Brandywine Falls seemed to be a popular destination, so we decided to make that our first stop. Oddly, the road to Brandywine seems to take you outside of the heart of the park, into a more residential area. We were about to turn around, certain we’d missed a sign or taken a wrong turn, when there it was: “Brandywine Falls: 1 Mile.” The falls themselves are lovely, but they’re nothing to write home about. Coming from Oregon, I’ve seen my fair share of beautiful waterfalls – it’s difficult to impress me. Brandywine was nice, but it’s a tier two waterfall at best. Yes, I’m a waterfall snob. The Brandywine trail is about a mile and can be difficult to find. The parks service erected a wooden walkway that provides a nice overlook of the falls, but if you continue on to the end of the boardwalk and loop around the paved road for a bit, you will also find a dirt trail that takes you down to the water. We spent a bit of time sitting on some large rocks in the river, taking in the scenery and enjoying the relaxing sounds of the bubbling stream. After a picnic lunch, it was on to Peninsula, OH to rent bikes. We rented from Century Cycles and took them out for a spin on the Towpath Trail, which runs along what used to be the Ohio and Erie Canal, once the main shipping artery in the area. The canal has since been filled in and is now quite overgrown, but the remnants of the many locks that were needed to raise the boats still remain. We spent about an hour and 45 minutes exploring the trail by bike, and our rental fee came to $24 – not bad for two bikes. Overall, it was a lovely day exploring a new part of the country. Cuyahoga Valley offers a nice oasis from its urban surroundings, but, as expected, it pales in comparison to some of the better known, “crown jewel” national parks of the west. If you’re planning to visit I’d suggest allotting 1-2 days, tops. If you’re interested in the scenic railroad, make sure you visit Wednesday-Sunday. Sadly, we were in the park on the two days of the week when it doesn’t run.